Valley pool tables have been known for quality and reliability for over 50 years, and were voted Best Coin-Operated Table for 18 years in a row. 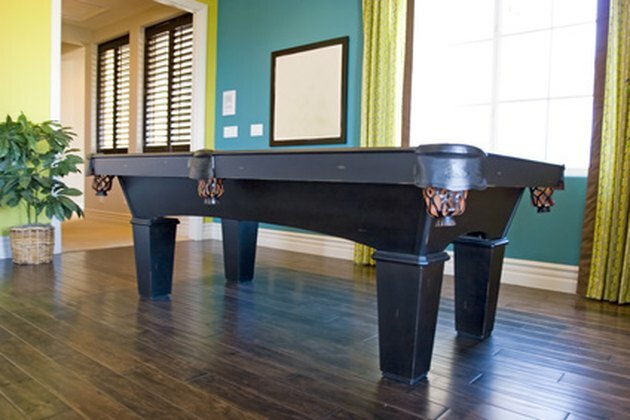 Valley crafts pool tables that stand out in home recreation rooms using premium wood and imported slate, yet still remain affordable. Disassembling a Valley pool table is not difficult, but it does require a great deal of care, and individual pieces can be quite heavy. Although not difficult, disassembling a pool table is heavy work. Wear eye protection while underneath the table to protect yourself from falling dust and debris. Undo three bolts on the underside of each rail, and two bolts from underneath each pocket. Pull apart the rails and lift off one at a time from each side of the table. Get help lifting each rail, being careful not to mar the finished surface. Lift each rail and flip it over to take off the pockets. Pull out the staples from around the edges of the wood frame holding the felt around the table. The felt can be reused if it has not been damaged when removing the staples. Unscrew 18 slate screws using a power drill with a flat-head attachment. Slate screws are located around the edge of the table and across the center beam. Break the beeswax seal holding the three slabs of slate together using the chisel. Lift each piece of slate out of the table along with a helper or two. Stack the slate between moving pads to prevent damage while transporting it. Retain the wood shims from beneath the slabs to reuse when leveling the table upon reassembly, if they are still in suitable shape. Replace them if necessary. Unbolt the legs from the frame. The frame needs no further disassembly and can be moved as a single piece. Save any wood shims that may have been used for leveling when the table was assembled. Cover all parts with moving pads and fasten strapping tape around them for protection of the glossy finished parts while moving.